The .d3dbsp structure, Call of Duty 4's variant on the well-known BSP format, is rather difficult to decipher. Since it's a binary file you can't simply read it. A hexadecimal editor is the best tool in this case. I am still deciphering it myself, I will post anything I happen to get known of regarding the file format. Be sure to read here and here before you even try to decipher it. Knowing what the technique is that BSP formatted maps use, could be handy as well. Also see Call of Duty 2: d3dbsp for more information. Every number ending with an 'h' indicates its a number using the hexadecimal count system. For other numbers one can assume the decimal count system is used. The file starts with 3 DWORDs: the header 'IBSP' indicating this is a BSP file originally designed by ID software. After these 4 initial bytes you find the BSP version number. CoD4 uses the version number 22 (16h), which is different from CoD2. The next 4 byte group is the amount of lumps in the current BSP. The number of lumps varies from 23 to 37. Without compiled light (test maps) you get 23 lumps or 24 with lights. Stock maps have usually 37. After the first 12 header bytes is an array filled with DWORD pairs, indicating the lumps' IDs and lengths. No absolute offsets are stored in this so called lump index in contrast to previous CoD BSP versions (each lump is connected). One can determine offsets by taking the previous lump's offset + length (padded to a multiple of 4). The first lump's offset is (3 + (number of lumps * 2)) * 4. Nonetheless, the first data byte has the offset 0. Don't count the header and the lump index! compiled). The bsp description yet only supports the 37-lumps version (a valid map). Texture information is 72 bytes long per texture. The first 64 bytes are used for the texture name. Then we have an DWORD for flags, and another DWORD for content flags. 3,145,728 bytes (3,072 kb) per entry. Equal to count of brush sides? ID 20h = 32 6 bytes per entry. Varying bytes per entry depending on size of entity. Basically a char terminated by a binary zero (=string). The entities lump is readable and stored almost the same way described in the .MAP file structure. 131,140 bytes (128 kB) per entry. 68 bytes per entry. - Redundancy?? Note: If not listed, either missing or ID not in use. Even though IW said the fastfiles were encrypted, in fact they are zlib-compressed memory dumps with a 12 byte header. Due to the process of building a fastfile, the linker loads all files (referenced in the csv) into memory. Assumedly, this happens in the same fashion like the game engine loads the data for later use into a large data structure (might be a database, have a look at the console messages). It seems that there is a pre-processing or a different way of storing the bsp data at runtime. Whether or not active changes are made, the data differs in any case. At this point it looks difficult to get all desired data, but the fastfile construction is still under investigation. 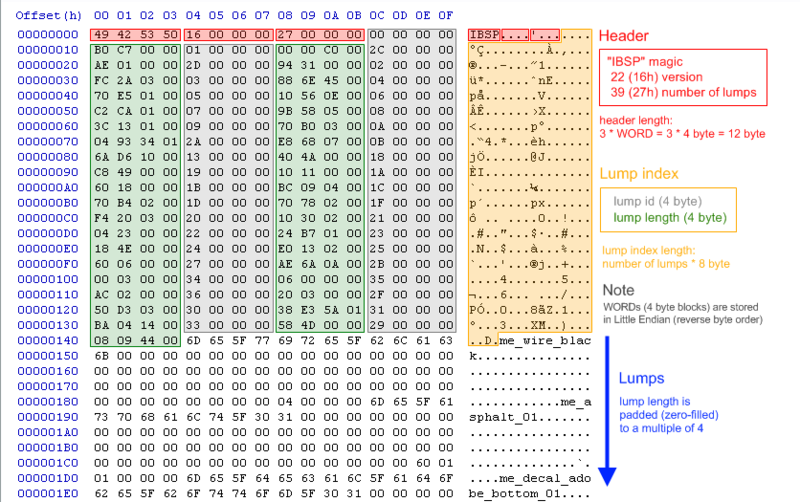 @Daevius: I couldn't find Lump 41 (5,114,460 bytes) and wasn't able to clearly identify the 9th and 10th lump (in order of the index). Lengths look good, but offsets seem to be screwed. 605 bytes of entity data (29th lump) are at the end of the 28th, in the entity lump are 285 bytes data of the following lump in return. This page was last edited on 4 January 2012, at 14:57.